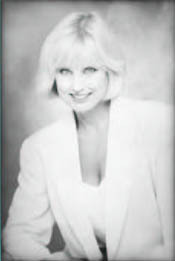 Betty Perry went into show business at the age of 61, doing stand-up comedy. "I couldn't wait for success, so I just went ahead without it," she laughs. One night in Denver, on her way to Los Angeles, Betty beat Roseanne Barr, winning first place in a comic stand off. To date, Betty has starred in FIFTY television commercials, and won at the Cannes Film festival for her portrayal of the Queen Mum. 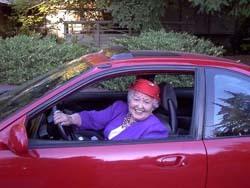 Betty's been on MTV, hosted talk shows, and been a stunt driver. She now drives a slick little candy apple red sports car with racing wheels, has driven a tractor since she was ten, and is "quite proud" of the fact that she can also drive a tank! At a Women in Film breakfast in Los Angeles Betty met twice Grammy nominated songwriter, Jan Buckingham. Jan had also decided to do some acting, and the two became fast friends. When Betty was in the hospital, Jan came to visit, painting Betty's fingernails and toenails lavender. That was just the lift Betty needed! Ten years later, while working together on a television commercial, Betty mentioned to Jan that she had always wanted to do a greeting card line. Jan offered to take some pictures, but Betty pointed out that Jan's camera did not have a 3.2 mega pixel capability, something Betty had just learned in her photography class! Jan bought a good camera and a stepladder, and much to her surprise, became a photographer. For the next three days Jan and Betty laughed themselves silly... and The Betty Perry Collection was born. The photos above are the First Edition in a series of comical colorful, clever and uplifting greeting cards. Jan and Betty believe that the world needs to laugh a little more often. With Jan and Betty's "NEW VIEW OF OLD AGE," they hope to put smiles on a lot of faces. With childlike excitement, Betty says it best: "There are no wrinkles on my soul."